Luxury vinyl flooring and waterproof composite flooring are both variations of resilient flooring. By its very nature, resilient flooring is... well resilient! It can stand up to just about anything life has to offer and its maintenance needs are very minimal. Follow these easy care guidelines and your resilient floors will look beautiful for years to come. Remove dirt and debris regularly: Dirt, small pebbles and other debris tracked in your shoes or your pet's feet are one of the top enemies of any floor. They can dull the floor's finish and over time scratch it as well. Your best defense is to have people remove their shoes at the door. Buy a good quality floor mat to trap dirt and grit and lay it next to a shoe tray. Stop the dirt from entering your house and you've won half the battle. The other half can be taken care of by regular sweeping or dust mopping - daily if the floor is in a high traffic area. Don't let liquids settle: Spills can cause damage if they are left on a floor too long. You certainly don't have the concerns of a spill soaking into carpet fibers or padding, but you still don't want to let a spill sit and dry on your floor. Wipe spills up with a clean, absorbent towel. If a residue is left behind, wipe that up with a damp cloth and then dry the floor again. Protect from scratches: Use protective pads for furniture and appliances to prevent them from scratching your floor. Resilient floors can handle some pretty heavy traffic, but over time furniture sitting in the same spot and moving along the same path is going to have an effect if precautions aren't taken. After sweeping up dirt and debris with a soft-bristled broom, simple mopping is all it takes to keep your floor looking like new. Use a damp mop and nonabrasive floor cleaner as recommended by the manufacturer. 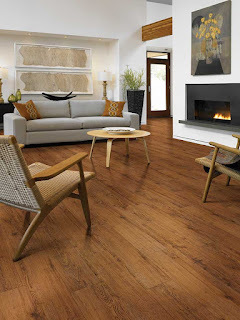 Thinking about resilient flooring for your home? With a full range of designs - including some that beautifully mimic natural hardwood and stone - and a price that's budget friendly it's no wonder that it's becoming one of the most popular floors in our showroom. From luxury vinyl tile to waterproof composite flooring, there's an option of resilient flooring that's just right for your home. Learn more about resilient flooring.